Zentangle is an easy to learn and relaxing method of creating beautiful images from repetitive patterns. It is a fascinating new art form that increases focus and creativity. Zentangle provides artistic satisfaction and an increased sense of personal well being. 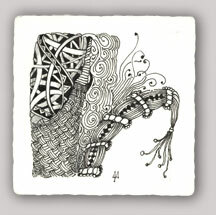 Zentangle is enjoyed by a wide range of skills and ages and is used in many fields of interest. Maria and Rick Roberts developed this fascinating creation. Visit Zentangle's website and learn more.